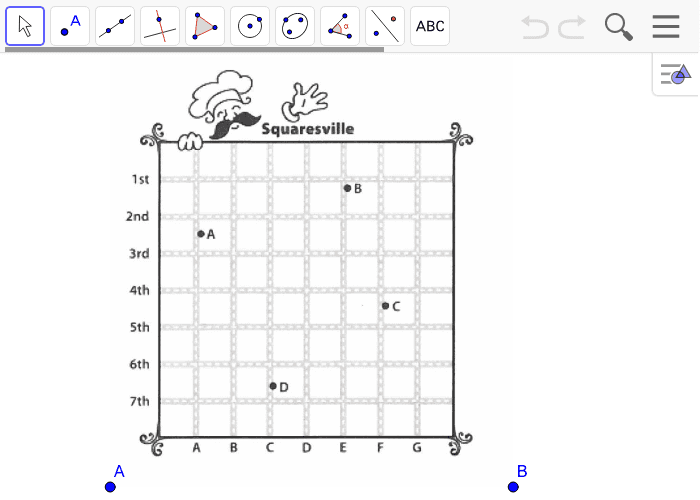 Now explore how to split Squaresville up into regions for four shops! How many perpendicular bisectors did you need to construct? Circumcenters? If a house located at the corner of E Street and 3rd Street called for delivery, which pizzeria would take the order? What is the approximate area of each region to the nearest half block? If calls are consistent across all of Squaresville, and you have 80 people overall to staff the four pizzerias. How many workers do you need for each? If you were able to move the four pizzerias, could they be placed such that the areas of their delivery regions would be equal? If so, sketch a map of Squaresville and the positions of the pizzerias below.